Due to the high cost of data subscription, many smartphone users are always looking for the cheapest data plan available. Most android smartphone users especially the mtk users prefer the Glo bb plan considering the fact that its relatively cheap (#1,000 for 3gb) compared to the other options and you can also use it on your android device. But the only thing is that you have to change your phone's imei no to a bb imei. 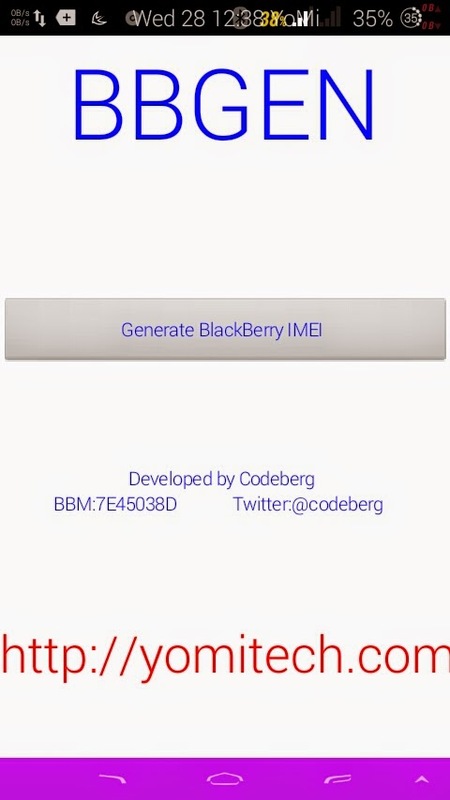 Generating a valid bb imei has always been a problem especially for those who don't have a PC, but all thanks to codeberg for his awesome application known as BBGEN, now you can generate a bb imei no on your phone just with a single click. You don't need an internet connection or root access to use this application. All you just have to do is to download the application from here. Then just click on Generate blackberry imei. If you need instruction on how to change your imei then click on this link . If you have any question, comment or contribution then you can drop it in the comment box below.